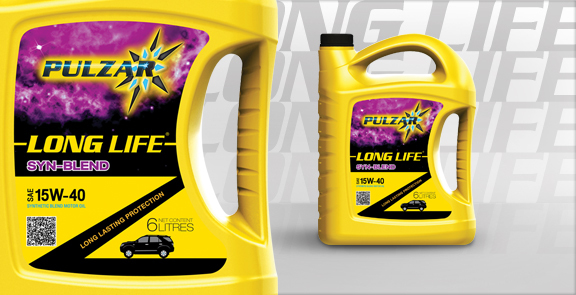 PULZAR LONG LIFE SYN-BLEND MOTOR OIL offers excellent protection for diesel and gasoline engines made in Europe, Japan and North America. It improves gas mileage, resists oxidation and extends oil change intervals by keeping engines cleaner, longer. This high performance engine oil is formulated from high quality synthetic base oils, highly refined base stocks and specially selected additives to keep viscosity stable, even in high temperatures and heavy load conditions. PULZAR LONG LIFE SYN-BLEND MOTOR OIL exceeds API Service Classification CI-4/SL. PULZAR LONG LIFE SYN-BLEND MOTOR OIL is recommended for both diesel and gasoline engines manufactured from Europe, Japan and America. It can be used in off-road vehicles, Sport Utility Vehicles (SUV) and other high performance engines that require the motor oil meeting API CI-4, CH-4, CG-4, CF-4, CF and SL Service Classifications. It also meets requirements of leading OEMs such Mercedes Benz, MAN, Volvo, Mack, CUMMINS, etc. Meets performance requirements of ACEA E7/B3-98/A2-96, MB-Approval 228.3/229.1, MAN 271, Volvo VDS-2, Cummins CES 20076, MTU Oil Type 1, Mack EO-M Plus, Renault Truck RD/RD-2, CAT ECF-1a, ZF TE-ML 07C and similar.